Sound is defined as a vibratory disturbance within a solid or liquid that travels in a wave pattern. When the sound frequency is between 20 hertz (Hz) and 20,000 Hz, the sound is audible to the human ear. To be considered ultrasound, sound waves must have a frequency of greater than 20,000 Hz (20 KHz), rendering them too high in frequency to be audible to the human ear. In ophthalmology, most A-scan and B-scan ultrasound probes use a frequency of approximately 10 million Hz (10 MHz) that is predesigned by the manufacturer. This extremely high frequency allows for not only restricted depth of penetration of the sound into the body but also excellent resolution of small structures. This meets unique needs, because, at times, the probe is placed directly on the organ to be examined, and its structures are quite small, requiring excellent resolution. The velocity of sound is determined completely by the density of the medium through which it passes. Sound travels faster through solids than through liquids, an important principle to understand because the eye is composed of both. In A-scan biometry, the sound travels through the solid cornea, the liquid aqueous, the solid lens, the liquid vitreous, the solid retina, choroid, sclera, and then orbital tissue; therefore, it continually changes velocity. The known sound velocity through the cornea and the lens (average lens velocity for the cataract age group, ie, approximately 50-65 y) is 1641 meters/second (m/s), and the velocity through the aqueous and vitreous is 1532 m/s. The average sound velocity through the phakic eye is 1550 m/s. The sound velocity through the aphakic eye is 1532 m/s, and the velocity through the pseudophakic eye is 1532 m/s plus the correction factor for the intraocular lens (IOL) material. The cornea is not routinely factored in because of its thinness. If one were to consider 1641 m/s at about 0.5 mm, only 0.04 mm would need to be added to the total eye length, which in no way alters the IOL calculation. In A-scan biometry, one thin, parallel sound beam is emitted from the probe tip at its given frequency of approximately 10 MHz, with an echo bouncing back into the probe tip as the sound beam strikes each interface. An interface is the junction between any two media of different densities and velocities, which, in the eye, include the anterior corneal surface, the aqueous/anterior lens surface, the posterior lens capsule/anterior vitreous, the posterior vitreous/retinal surface, and the choroid/anterior scleral surface. The echoes received back into the probe from each of these interfaces are converted by the biometer to spikes arising from baseline. The greater the difference in the two media at each interface, the stronger the echo and the higher the spike. If the difference at an interface is not great, the echo is weak and the displayed spike is short (eg, vitreous floaters, posterior vitreous detachments). No echoes are produced if the sound travels through media of identical densities and velocities, eg, young, normal vitreous or the nucleus of a noncataractous lens, in which the A-scan display goes down to baseline. See the image below. High quality contact A-scan of the phakic eye. 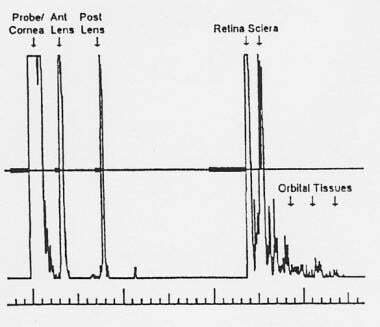 Note the 5 high-amplitude spikes and the steeply rising retinal spike, as well as the good resolution of the separate retinal and scleral spikes. In the case of a cataractous lens, multiple spikes occur within the central lens area as the sound beam strikes the differing densities within the lens nucleus. This spike height, or amplitude, is therefore what gives the information on which to base the quality of the measurements. In fact, the "A" in A-scan is from the word "amplitude." Spike height is not only affected by the difference in density as it travels through the eye but also by the angle of incidence, which is determined by the probe orientation to the visual axis. If the probe is held so that the emitted sound beam strikes the corneal vertex, anterior lens, posterior lens, and retina in a perpendicular manner, it is in the proper position to receive the echoes back into the probe tip so they can be converted to spikes. Because sound waves can be reflected and refracted the same as light rays, if the probe is held in a nonparallel manner, part of the echo is diverted at an angle away from the probe tip, and, therefore, is not received by the machine. The greater the angle of incidence, the weaker the signal and the shorter the spike amplitude. See the image below. 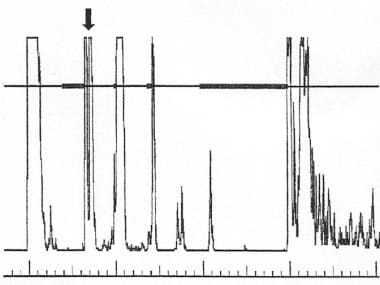 When the sound beam incidence is parallel and coaxial to the visual axis (upper image), most returning echoes are received back into the probe tip to be interpreted on the display as high-amplitude spikes. When the sound beam incidence is oblique to the visual axis (lower image), part of the returning echo is reflected away from the probe tip, with only a portion received by the probe. As a result, the spikes will be compromised. The shape and smoothness of each interface also affects spike quality. An irregularity in the surface of an interface causes reflection and refraction of the returning sound waves away from the probe tip and, therefore, weaker echoes. That is why it is important to know whether macular pathology is present that could adversely affect spike quality. A perfect high, steeply rising retinal spike may be impossible when macular pathology is present (eg, macular edema, macular degeneration, epiretinal membranes, posterior staphylomas). See the image below. If the macular surface is smooth (upper image) more of the echoes are received back into the probe to be displayed as high-amplitude spikes. If the macular surface is convex (center image), as with macular edema or pigment epithelial detachments, part of the echoes is reflected away from the probe tip. If the macular surface is irregular (lower image), as in macular degeneration or epiretinal membranes, reflection of the echoes away from the probe tip also will occur. In addition, sound is absorbed by everything through which it passes before it travels on to the next interface. The greater the density of the structure it is passing through, the greater the amount of absorption. This principle explains why retinal spike quality is reduced in the case of an extremely dense cataract; the lens absorbs much of the sound and less sound actually reaches the retinal surface. The gain setting on biometers is measured in decibels and affects amplification and resolution of the displayed spikes. When on highest gain, the spike height and the sensitivity of the display screen are maximized, enabling visualization of the weaker signals, but the resolution is affected adversely. When gain is lowered, the spike amplitude and the display sensitivity are decreased, which eliminates the weaker signals but improves the resolution. Resolution is defined as the ability of the machine to display two interfaces that lie in close proximity, one directly behind the other, as separate echoes or spikes (eg, retinal and scleral interfaces). When the gain is too high, the retina and sclera appear as one thickened spike with a wide, flattened peak. The examiner should reduce the gain until the retinal and scleral surfaces are seen as separate spikes to the right of the display. The density of the cataract determines the need for changing the gain setting due to absorption of the sound. The more dense the cataract, the higher the necessary gain. Patients who are aphakic require less gain to prevent merging of the retinal and scleral spikes. Therefore, the gain setting may vary not only from patient to patient but from one eye to the next in the same patient, depending on cataract density. When the gain setting is too high, the resolution of the separate retinal and scleral spikes is lost, resulting in 1 thick, flattened spike. Gates are electronic calipers on the display screen that measure between two points. Biometers are designed so that between each pair of gates a measurement is rendered. Biometers vary in the appearance of these gates, with some units not displaying them at all. Gates should be readily visible for accurate editing of the scans, because if any one of them is aligned along an incorrect spike the entire eye length measurement will be erroneous. The biometer automatically places a gate on what it believes to be the corneal spike, the anterior lens spike, the posterior lens spike, and the retinal spike, and it is programmed to measure the distance between each pair of gates at a given velocity. Gates are electronic calipers on the display (see arrows) that between each pair render a measurement. In this 4-gate system, each of the 3 sections of the eye is measured individually at its correct velocity, then added together for the total eye length. Equipment will vary in the appearance of these gates. For example, in the phakic mode, the machine has been programmed to measure distance between the first pair of gates using a velocity of 1532 m/s, the velocity through the anterior chamber. The velocity of 1641 m/s is used between the second and third gates because this is the velocity through the lens. The velocity of 1532 m/s is once again used in the formula between the third and fourth gates because this is the velocity through the vitreous cavity. The most accurate machines measure each of these 3 sections of the eye individually at the proper sound velocity and then add them together for the total eye length. If any one gate is incorrectly placed, the machine will calculate the 2 sections involved using the incorrect velocity and time, which will make the total length erroneous. Proper gate placement is on the ascending edge of each appropriate spike. If a gate has been placed incorrectly, move it to the appropriate spike before it is stored and used in the calculation. Equipment varies greatly in the ability to see and move gates; refer to the manual for each specific unit to determine if it is possible to move the gates, and, if so, the steps required to do so. If the biometer does not allow for movement of gates, scans must be repeated until they automatically align properly. When the machine is set for phakic average, only 2 gates are present, measuring the total eye at its average velocity of 1550 m/s. The 2 gates should align along the corneal surface and the retinal surface, respectively. The disadvantages to this setting are that the anterior chamber depth and the lens thickness cannot be monitored and that the use of average sound velocity is simply not as accurate. The average sound velocity of 1550 m/s is only accurate through an average length eye. In eyes that are shorter or longer than average, this method of measuring produces an innate error. When setting the measurement mode to aphakic, 2 gates will be present (on the respective corneal and retinal surfaces), and the biometer will calculate the distance at a velocity of 1532 m/s, the correct velocity for the aqueous and vitreous. When setting the measurement mode to pseudophakic, depending on how many pseudophakic options the equipment possesses, the eye length is calculated using 1532 m/s for the aqueous and vitreous, then the correction factor for the given implant material is added. If only one pseudophakic mode option is available, it only will be accurate for polymethyl methacrylate (PMMA) IOLs. Routinely using automatic mode on most equipment increases the risk of error because every biometer will capture poor quality scans. Biometers are programmed to capture any scans with spikes that are of high amplitude within their given area. 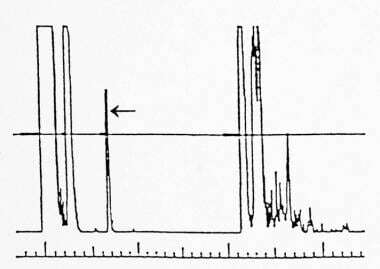 However, they often cannot determine if the spike arose steeply from baseline or if a slope or step is present in the spike origin. Manual mode is sometimes preferable, in which the examiner presses a foot switch to capture the scan when it is seen to be of high quality. Equipment varies greatly with some manufacturers only using a 4-gate system on automatic mode, which means that anterior chamber depth can be monitored only in automatic mode. If this is the case, automatic mode is preferable, but the examiner must carefully edit the scans stored by the machine. It is critical that the examiner use methods that are standard of care in performing biometry. A 0.1 mm error in an average length eye will result in about a 0.25 diopter (D) postoperative refractive error. 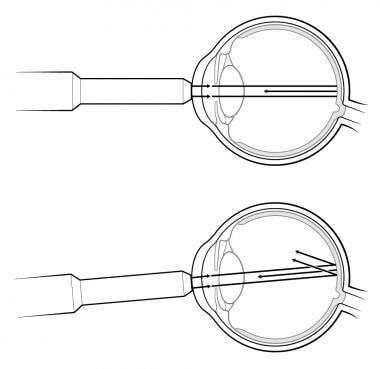 Therefore, an error of 0.5 mm will result in approximately 1.25 D refractive error, and an error of 1.0 mm will result in approximately 2.50 D postoperative refractive error. Longer eyes are more forgiving, with a 1.0 mm error in an eye of 30 mm length resulting in a post-operative error of about 1.75 D. Small eyes are the least forgiving, and even more postoperative error occurs from inaccurate measurements. For example, an error of 1.0 mm in an eye that is 22.0 mm long will result in a post-operative error of about 3.75 D. If the error is in measuring the eye erroneously small, such as is common from corneal compression, the postoperative refractive error will be in the myopic direction. Conversely, if the examiner measures the eye erroneously long, which is common when the sound beam is not perpendicular to the retinal surface, the postoperative refractive error will be in the hyperopic direction. A good biometrist must be able to recognize when readings appear abnormal; therefore, one must first know standard dimensions of the eye. The average axial eye length is 23.5 mm, with a range of 22.0-24.5 mm. In general, the smaller the eye, the more hyperopic the refractive error. The longer the eye, the more myopic the refractive error. Of note, a patient can be myopic because of steep corneal curvature rather than long axial length, and a patient can be hyperopic because of flat corneal curvature rather than short axial length. Once the eye length is measured, compare it to the precataract refractive error of the patient to ensure that the readings appear accurate. The precataract refractive error is important because the cataractous lens changes can induce a more myopic prescription. The reference range between the right eye and the left eye of the same patient is within 0.3 mm, unless evidence suggests the contrary (eg, previous scleral buckling, anisometropia, corneal transplantation, keratoconus, refractive surgery, hypotony). The average anterior chamber depth is 3.24 mm but varies greatly. If the biometrist is documenting a shallow anterior chamber depth, examine the medical chart for clinical correlation of this finding. The average lens thickness is 4.63 mm but this also varies, and, with cataractous changes, the lens will increase in thickness to as much as 7.0 mm in extremely dense cases. The average keratometry (K) reading is 43.0-44.0 D, with one eye typically within a diopter of each other. Check these readings against the refractive error of the patient for accuracy. If one eye is found to differ from the other by more than 1 D, immediately begin researching the cause and alert the physician. For instance, if the patient had refractive surgery, corneal transplantation, an injury with a resultant corneal scar, or has keratoconus, the K readings may vary between the eyes. It is rare for the patient to have disparate K readings biologically. If any of the above eye measurements is found to be unusual, another technician should recheck the measurements and immediately alert the physician. Just as precise keratometry and biometry are critical for good surgical outcomes, correct IOL placement by the surgeon is essential. A 0.19 D postoperative refractive error occurs for every 0.1 mm posterior chamber intraocular lens (PCIOL) displacement. A 0.12 D postoperative refractive error occurs for every 0.1 mm anterior chamber intraocular lens (ACIOL) displacement. Lens displacement can also be caused by the patient's ciliary body pushing the lens out of position rather than by the surgeon's placement of the lens. Using the correct IOL calculation formula is important for good surgical outcomes. Current 2-variable formulas that are considered the most accurate include the Hoffer Q, SRK/T, and Holladay I. Two-variable formulas are those that only take into consideration the axial length and the corneal curvature. Multivariable formulas have proven to be the most accurate due to more of the eye anatomy being considered. The Haigis formula is a 3-variable equation, using not only axial length and corneal curvature but also the anterior chamber depth of the eye. The Holladay II formula is a 7-variable equation widely thought to be the most accurate formula; it takes into account axial length, corneal curvature, horizontal white-to-white, anterior chamber depth, lens thickness, precataract refractive error, and age of the patient. Predicting lens position is one of the most common causes of a postoperative surprise; by taking more of the eye anatomy into account, this can be more accurately predicted. For average-length eyes with average Ks, these formulas give almost identical calculations. However, when the eye is small, formula selection is more critical. In eyes that are less than 22 mm in length, the Hoffer Q and the Holladay II IOL Consultant formulas are the most accurate. For long eyes, the SRK/T and the Holladay II IOL Consultant formulas are the most accurate. The Holladay II IOL Consultant formula is also the only formula that calculates for piggyback IOL procedures (ie, when 2 IOLs are implanted, which may be necessary when the eye is so small that 1 implant does not contain enough converging power, or when a piggyback lens is inserted to correct a postoperative surprise that results from the first implant) and is highly recommended for patients that have had previous refractive surgery. Historically, the contact (or applanation method) of biometry was accomplished by gently placing the probe on the corneal vertex and directing the sound beam through the visual axis. This handheld method was most easily and accurately performed with the patient in a reclined position with the patient's head placed in front of the display screen of the biometer. The examiner was seated on an adjustable stool to the other side of the patient, resting his or her arm on the patient's shoulder and the side of his or her hand on the patient's cheek. The patient was instructed to look at a target affixed to the ceiling. Using a gentle on-and-off technique allowed for less corneal compression since the examiner's hand was braced more firmly. It was also easier for the patient to brace the head against the headrest in this reclined position and for the examiner to simultaneously monitor both the display screen and the patient's fixation. Because of the indentation of the globe caused by the contact (or applanation method) of biometry as well as the current patient expectations, this method is being completely abandoned in favor of more accurate noncontact instrumentation. The immersion technique of biometry is accomplished by placing a small scleral shell between the patient's lids, filling it with saline, and immersing the probe into the fluid, being careful to avoid contact with the cornea. This method is more accurate than the contact method because corneal compression is avoided. Eyes measured with the immersion method are, on average, 0.1-0.3 mm longer than when measured by the contact method since no indentation of the globe occurs. [2, 3] The display screen will exhibit 6 (rather than 5) spikes in the phakic patient because the probe and the cornea are no longer in contact with each other, thus appearing separate. Of note, some machines have the probe spike shifted so far to the left in the immersion mode that it does not appear on the display screen; therefore, the corneal spike will be seen first. 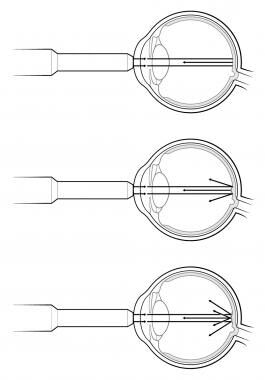 The correct axial pattern past the probe spike consists of 5 tall spikes that represent the cornea, the anterior lens, the posterior lens, the retina, and the sclera. 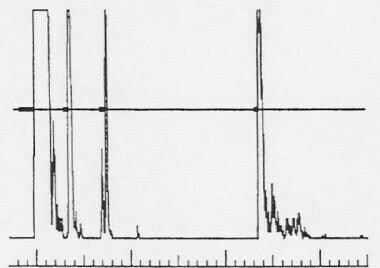 Perpendicularity is achieved when all spikes are of high amplitude and the retinal spike is steeply rising from the baseline. Another advantage of the immersion technique is that the corneal spike will have two peaks corresponding to the epithelium and endothelium. If both of these peaks are not equally high, the sound beam is not directed through the corneal vertex and, therefore, is not aligned along the visual axis. Care should be taken to keep the gain low enough to appreciate and resolve these two peaks. If the gain is set too high, poor resolution of these two interfaces will occur and the corneal peak will appear wide and flattened. Immersion scan of the phakic eye. 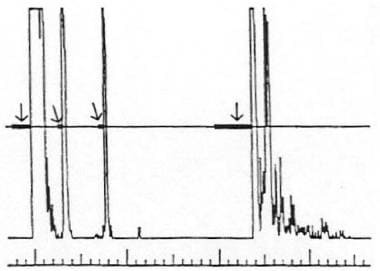 The probe and cornea are now separate spikes since they are not in contact with each other, and the corneal spike demonstrates 2 peaks (see arrow), representing the epithelium and endothelium. If these 2 peaks are not both high, the sound beam is not aligned through the corneal vertex. Gain must be reduced enough to appreciate and resolve these 2 peaks. Other advantages of the immersion technique are that it is a faster method than the contact technique and that it reduces technician dependency. When using the contact technique, axial lengths will vary on subsequent scans by the same technician, as well as between technicians depending on the amount of corneal compression. When using the immersion technique, as long as the spikes are of high quality, the axial lengths will not vary from one scan to the next or from one biometrist to the next. Any practice that changes from the contact technique to the immersion technique must repersonalize their IOL constants in their IOL calculations, since they are achieving true rather than slightly shortened eye length measurements. A study should be completed of at least 20 eyes with the new technique, the same surgeon, and the same IOL to determine the correct personalization of the constant. Another current method for highly accurate axial length measurements does not use ultrasound at all, but rather optical coherent light. In this method, optical coherent light passes through the visual axis and reflects back from the retinal pigment epithelium. Because the light reflects back from a layer deep into the retina, rather than from the internal limiting membrane as with ultrasound (which all of the formulas used today expect), Dr. Wolfgang Haigis calibrated the system to immersion biometry during its development. Based on his comparison of 600 eyes with optical coherence biometry and with immersion, an amount is subtracted from the measurement to the RPE based on axial length. The result should coincide to an immersion A-scan to within 0.1 mm if both are good readings; because this is a noncontact method, its accuracy is superior to contact ultrasound biometry. However, this method cannot be used in the event of significant media opacity (eg, dense cataracts or corneal or vitreal opacity) due to absorption of the light, or an inability of the patient to fixate on the target. For those practices using optical coherence, immersion ultrasound is necessary for patients who cannot be measured by optical coherence to ensure the same high level of accuracy. In recent years, optical coherence has tended to measure long eyes (>25 mm) too long. Although correction equations have been published,  care should be taken because occasionally the measure is not inaccurate. The best way to be certain the axial length is correct is by verifying with both immersion A-scan and B-scan biometry. Biometry through an already pseudophakic eye most commonly is performed to compare to the fellow phakic eye for accuracy. Other reasons to measure the pseudophakic eye include patients who are scheduled to undergo an IOL exchange or checking an unwanted postoperative refractive error. Measurement through the pseudophakic eye will result in multiple reverberation echoes in the vitreous cavity that tend to decrease in amplitude from left to right. The number and strength of these reverberations is dependent on the IOL material. Decreasing the gain in the pseudophakic eye is helpful, so that spike amplification of these artifacts is reduced, reinforcing correct gate placement on the retinal spike. Reverberation artifacts in the vitreous cavity resulting from intraocular lens. The left image demonstrates the longer chain of artifact spikes from polymethyl methacrylate implants. The image on the right demonstrates the shorter chain of artifact spikes from foldable implants. To obtain accurate measurements through the pseudophakic eye, knowledge of the implant material is essential. Most IOLs are currently made of PMMA, acrylic, or silicone. The velocity of sound through each of these materials is different because of their differing densities and if measured with the wrong modality can result in significant error. If an eye with an acrylic IOL is measured on pseudophakic PMMA mode, a 0.2 mm error will occur. If an eye with some silicone IOLs is measured on PMMA mode, a 1.2 mm error will occur. If a biometer only has one pseudophakic setting, it will be accurate for PMMA only because it was manufactured when PMMA was the only implant material being used, and some biometers do not have upgrades for the various IOL materials. If this is the case, the way to achieve accurate measurements is to use the aphakic setting, which uses a sound velocity of 1532 m/s. Then, the examiner should manually add the correction factor for the IOL material to the results obtained on aphakic mode. The correction factor is +0.4 mm for PMMA, +0.2 mm for acrylic, and -0.4 mm to -0.8 mm for silicone, depending on the silicone velocity. Therefore, if an eye measured 23.32 mm on aphakic mode and the IOL is made of PMMA, the correct axial length is 23.72 mm. If the IOL is acrylic, the correct axial length is 23.52 mm. If it is low-velocity silicone, the correct length is 22.52 mm. When any new implant material is produced, the correction factor can be calculated using the CT of the IOL and the sound velocity of the material at body temperature (35°C), which must be supplied by the manufacturer. The formula for this calculation is the CT multiplied by 1 minus 1532 divided by the velocity of that material, or CT X (1-1532/vel). For example, if the IOL has a CT of 0.8 mm, and the sound velocity of the material is found to be 1040 m/s, then 0.8 X (1-1532/1040) = 0.8 X -0.473 = -0.378. Therefore, the correction factor for this eye is -0.378 from the length obtained on aphakic setting. Another problem arises when the implant material is unknown. If the patient has a wallet card showing the implant used, the manufacturer may need to be called to determine implant material if the model is unfamiliar to the examiner. If the patient does not have a wallet card, contact the surgeon's office to determine the implant used. If the patient cannot recall the surgeon's name, it may be necessary to contact a family member in the case of an IOL exchange. However, the implant reverberation pattern may prove helpful because PMMA has a longer chain of reverberation echoes, followed by acrylic and then silicone. A problem should be suspected if a difference between the 2 eyes of more than 0.3 mm is present or if a difference in consecutive measurements occurs on the same eye of more than 0.1 mm. In these instances, consult the patient's history to see if a medical reason exists for a difference or macular pathology that could explain the variation on the same eye (eg, posterior staphyloma). The most common error in the contact technique is corneal compression. This inevitably occurs because the eye is pliable and the cornea is indented even with minimal pressure from the probe tip. The lower the intraocular pressure the softer the eye and the more significant the corneal compression. Therefore, the amount of compression can vary even with the same technician. If the contact technique must be used, the anterior chamber depth must be monitored and the shallower anterior chamber depths deleted even if the spikes appear to be of high quality. Of course, the immersion method completely avoids corneal compression, which is why the contact method is becoming obsolete. Corneal compression is demonstrated in the A-scan on the right. Note the more shallow anterior chamber depth of 2.63 mm as compared to the scan of the same eye on the left, with an anterior chamber depth of 3.20 mm, indicating 0.57 mm of corneal compression. Note also that the total eye length is shortened from 24.60 mm in the scan on the left to 24.18 mm in the scan on the right. This error would result in an unwanted postoperative refractive error of about -1.25 D.
The second most common error is misalignment, either by not obtaining perpendicularity to the macular surface or by not directing the sound beam through the visual axis. Perpendicularity to the macular surface is achieved when the retinal spike and scleral spike are of high amplitude, and the retinal spike arises steeply from baseline. No sloping of the retinal spike should be present and no jags, humps, or steps should be present on the ascending edge of that spike. Misalignment errors. The A-scan on the left demonstrates a contact scan with a sloping retinal spike. 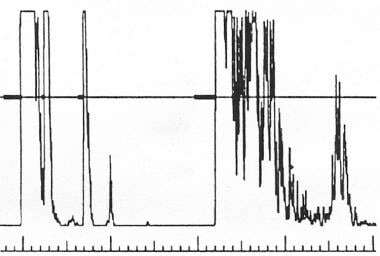 The A-scan on the right demonstrates an immersion A-scan with steps in the initial rise of the retinal spike. If either the posterior or anterior lens spike are not of high amplitude, the sound beam could be misaligned at an angle through the lens and, therefore, not through the visual axis. The posterior lens spike may be slightly shorter than the anterior lens spike because the convex curvature of the posterior lens is steeper than the convex curvature of the anterior lens surface, allowing for reflection of the echoes away from the probe tip. Also, if a dense nuclear sclerotic cataract is present, more sound absorption could occur within the lens, causing the posterior lens spike to be shorter. In these instances, the gain can be increased to obtain better posterior lens and retinal/scleral spikes. Misalignment demonstrated by the decreased amplitude of the posterior lens spike (arrow). When either of the lens spikes is too short, the sound beam is aligned at an angle through the lens rather than through its center, and thus not aligned along the visual axis. Misalignment along the optic nerve is an error that is easily recognized, since the scleral spike will be absent. The retinal spike will be present and of high amplitude and can even appear steeply rising, but, if the scleral spike is not as high in amplitude as the retina, the sound beam is misaligned along the nerve. No sclera is present at the optic nerve; the sound beam is passing through the nerve cord with only short amplitude echoes present, because the sound beam is striking blood vessels within the nerve cord. In the normal eye, there will generally not be a great difference in axial length when aligned along the optic nerve, but, in cases of a full optic disc, papilledema, or optic disc drusen, this will result in an erroneously short axial length measurement. In cases of optic nerve cupping, as seen in glaucomatous eyes, this error results in an erroneously long axial length measurement. Misalignment along the optic nerve. Note the missing scleral spike. Another possible error in the contact method is a fluid meniscus between the probe tip and the cornea caused from ointment use, methylcellulose in the eye from previous examinations, or abnormally thick tear film. If either of these is suspected, rinse the eye with sterile saline prior to biometry. Extremely dense cataracts can be a challenge because of absorption of the sound beam as it passes through the lens. A higher gain setting may be necessary to achieve high-amplitude spikes from the retina and sclera. Improper gate placement also can occur easily, because a dense cataract produces multiple spikes within the lens. The posterior lens gate may erroneously align along one of the echoes within the lens nucleus, resulting in an erroneously thin lens thickness and erroneously long vitreous length, which results in an error in the total length of the eye. In this case, manually realign the gate to the correct posterior lens spike, and if the equipment does not allow for manual gate placement, repeat scans until the gates automatically align properly. Posterior staphylomas are among the greatest biometry challenges. These occur primarily in high myopes, where the globes are so elongated and thin that the posterior uvea bulges outward into the sclera, most commonly in the posterior pole. This causes the macula to be sloped in configuration, which in turn causes reflection of the sound beam away from the probe tip and a poor retinal spike. It is impossible to obtain perpendicularity to a macular surface that is sloped; thus, it is impossible to obtain a proper retinal spike. Also because of the sloped surface, the measurements will be not only long but extremely variable. Patients must be alerted that because their eye is misshapen, they have a higher risk of the postoperative result not being as accurate as a patient with a normally shaped, round globe. When this probe position is achieved, the B-scan display will demonstrate the epithelial and endothelial corneal echoes centered to the left, the posterior lens surface just to the right, and the optic nerve void just above the center to the far right. The macula will lie centered on the right, about 4.5 mm below the center of the optic disc. Simply place calipers on the vertex of the epithelial corneal echo and on the macula to measure the axial length at average sound velocity of 1550 m/s. Compare this axial length measurement to the various biometry measurements, and use the measurement that has the most comparable vitreous length in the IOL calculation, preferably within 0.1 mm. High myope with a long eye. Note the poor quality of the retinal spike on the A-scan. The axial length from the anterior corneal surface to the central macula was measured on the B-scan (left image), and compared to the variable A-scan measurements. The A-scan that was within 0.1 mm of the B-scan measurement was used in the intraocular lens calculation. Optical coherence biometry has been shown to be beneficial in the case of the highly myopic globe because it measures to the fixation point of the patient and the lack of perpendicularity is not prohibitive. But again, optical methods are not always usable if the patient has a dense cataract or other media opacity or the inability to fixate, so ultrasound techniques still need to be used in these situations. Known macular retinal detachments are yet another challenging situation. In retina practices, the physician may decide to remove the cataract while the patient is undergoing retinal detachment repair and will need accurate IOL calculations. In these cases, the retinal spike will appear further to the left in the vitreous cavity, depending on the elevation of the macula. In these instances, the retinal gate should be moved from the detached retina to the next more posterior spike, since the retina should lie back into this position once repaired. The examiner should inquire if the surgeon plans to place a scleral buckle around the globe to repair the detachment, and if so manually add another 0.5-1.0 mm to the total eye length to account for lengthening of the globe by the buckle postoperatively. When cataract surgery is performed on a patient who has had a previous refractive procedure, accurate keratometry readings are not obtainable by standard manual or automated keratometers. Because myopic refractive procedures flatten the central cornea, keratometer mires are spread over a larger area and now measure approximately the central 4.5 mm of the cornea rather than the central 3.0 mm. Therefore, use of standard corneal measurements for IOL calculations results in hyperopic postoperative refractive errors. Topography also is not accurate for postrefractive corneal curvature measurements. While this section is in no way a comprehensive listing of the methods suggested by the experts for calculating corneal curvature following refractive surgery, the more common methods will be described. One of the popular methods for determining corneal curvature after refractive surgery has been the clinical history method, although it is falling out of favor over time. The data needed in this method include the spherical equivalent refractive error prior to refractive surgery, the average keratometry reading prior to the refractive procedure, and the spherical equivalent refractive error postrefractive procedure. The examiner should use caution not to use the current refractive error, as the patient may have a myopic shift due to the presence of the cataract. The formula for this method for patients who are myopic and undergoing refractive surgery is as follows: K = Preoperative average K minus the change in manifest reaction prerefractive and postrefractive surgery. Because any change in refractive error from a refractive procedure is due to corneal flattening, the change in refractive error from the refractive procedure subtracted from the average K prior to the procedure is the current central corneal curvature. For example, if a patient had an average K of 45.75 D and a refractive error of -8.25 D prior to refractive surgery with a plano postoperative result, that is a change of 8.25 D of corneal flattening. The K reading to use in the IOL calculation is 37.5 D (ie, 45.75 D - 8.25 D = 37.5 D). The examiner should not be concerned with the resultant low corneal curvatures. As high myopes, many patients underwent extensive corneal flattening from the refractive procedure. If the patient underwent hyperopic refractive surgery, the history method can still be used; however, rather than subtracting the amount of correction, it should be added because the cornea was in effect steepened rather than flattened by the procedure. Many experts suggest using a consensus approach for determining corneal curvature after refractive surgery, rather than one method alone. Online calculators are available to help with this approach. Other methods currently being used include the corneal power correction equation by Shammas. This equation involves measuring the Ks now and then averaging them into one number. So, the corrected K = 1.14 (average K) - 6.8. Another method, referred to as the topography method, as published by Wang et al, involves measuring the eye with topography, multiplying that number by 1.114, and then subtracting the correction factor of 6.1. Another method faring well in recent studies is the Masket Formula. This formula involves an adjustment in the final IOL power rather than an adjustment of the keratometry readings in the refractive surgery patient. 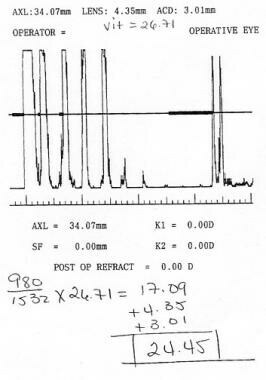 In Dr. Masket's study, keratometry and biometry were performed with the IOL Master as with standard cataract patients, and then the following formula was used to adjust the calculated power from those measurements: IOL adjustment = LSE X (-.326) + 0.101, where LSE = the spherical equivalent of change after laser vision correction. If the patient had myopic correction, the LSE should be a negative number, and if hyperopic correction, a positive number. In other words, if a myopic refractive patient has standard calculations of +16.0 D, and LSE was 6 D of myopia, -6 X (-0.326) + 0.101 = +2.057, which should be added to the calculated +16 D for a final IOL power of +18 D. If a patient had hyperopic refractive surgery and the calculation yielded a power of +22 D, and LSE was 3 D of hyperopia, +3 X (-0.326) + 0.101 = -0.877, which is added to the calculated implant power of +22 D, for a final IOL power of +21 D.
An online calculator is recommended for these patients because mathematical errors can occur. The most popular calculator is from the American Society of Cataract and Refractive Surgeons. This calculator is constantly maintained and contains the most highly recommended methods. Multiple methods are embedded with instant results for comparison, with the user merely inputting the required measurements. The methods used and their results are divided into 3 columns: Those that require history for both the change in corneal curvature and refractive change, those that require history for the refractive change only, and those that require no history at all. The general consensus is that the nonhistorical methods tend to outperform those that require history. Because records are difficult to obtain in many cases, this is a tremendous relief. These patients should be forewarned that they have a higher risk of an imperfect resultbecause of their previous refractive surgery and that another procedure may be required afterward to get them back to their desired visual acuity. These procedures could include an IOL exchange, a piggyback lens, or more refractive surgery. In the event of an incorrect eye type setting, this equation is quite simple to use and will preclude the need for the patient to return for repeat measurements. For example, an aphakic eye was measured incorrectly with the phakic average setting. The correct velocity for this eye is 1532 m/s. The velocity used was 1550 m/s. If the eye length obtained was 24.1 mm on the phakic average setting, then 1532/1550 X 24.1 = 23.82 mm = true eye length. The corrected vitreous length is now added back to the anterior chamber depth and lens thickness for an accurate total eye length. Biometry is best performed with these patients sitting upright so the bubble will not separate from the retinal surface, causing a spike to arise at the back of the bubble, which can be confused easily with the retinal spike. If an aphakic patient has silicone oil in the eye, it must be determined whether or not the oil is in the anterior chamber or only the posterior chamber. If the oil is only in the posterior chamber, the ACD should be subtracted from the total length, the vitreous length corrected using the velocity conversion equation, then added back to the ACD. An eye with silicone oil in the vitreous cavity. The erroneous vitreous length was isolated from the measurements and the velocity conversion equation used to correct for the sound velocity through silicone oil. The corrected vitreous length was added back to the anterior chamber depth and lens thickness for a true eye length measurement. Then, add back to the ACD along with the correction factor for the IOL in place. Some newer ultrasound units have adjustable velocities or silicone filled eye types. In these cases, the vitreous velocity is simply changed to the appropriate velocity through the silicone oil, and the measurement is taken while the patient is sitting upright. Also, optical coherence biometry has been shown to be effective in measuring these eyes, although the cataract must be mild enough for it to be used and the patient must have the ability to fixate. If the silicone oil is to be left in the eye permanently, power must be added to account for the index of refraction of the silicone oil. Consulting the Holladay II IOL Consultant formula for this calculation is best. Also, a silicone IOL should not be implanted in these eyes, because it will adhere to the silicone oil. Byrne SF, Green RL. Ultrasound of the Eye and Orbit. 2nd ed. St Louis, MO: Mosby, Inc;. 2002. Byrne SF. A-Scan Axial Eye Length Measurements: A Handbook for IOL Calculations. Mars Hill, NC:. Grove Park Publishers. 1995. Shammas, H. John. Intraocular Lens Power Calculations. 6900 Grove Road, Thorofare, NJ 08086 USA: SLACK Incorporated; 2004. Trivedi RH, Wilson ME. Prediction error after pediatric cataract surgery with intraocular lens implantation: Contact versus immersion A-scan biometry. J Cataract Refract Surg. 2011 Mar. 37 (3):501-5. [Medline]. Wang L, Shirayama M, Ma XJ, Kohnen T, Koch DD. Optimizing intraocular lens power calculations in eyes with axial lengths above 25.0 mm. J Cataract Refract Surg. 2011 Nov. 37(11):2018-27. [Medline]. Randleman JB, Foster JB, Loupe DN, Song CD, Stulting RD. Intraocular lens power calculations after refractive surgery: Consensus-K technique. J Cataract Refract Surg. November 2007. 33:1892-1898. Walter KA, Gagnon MR, Hoopes PC, Dickinson PJ. Accurate Intraocular Lens Power Calculation after Myopic Laser in Situ Keratomileusis (LASIK), Bypassing Corneal Power. J Cataract Refract Surg. March 2006. 32:425-429. Masket S, Masket SE. Simple regression formula for intraocular lens power adjustment in eyes requiring cataract surgery after excimer laser photoablation. J Cataract Refract Surg. March 2006. 32:430-434. Artaria LG. Messung der bulbuslange mit verschiednen ultraschall-geraten. Klin Monatsbl Augenheilkd. Vol 188. 1986: 492-4. Binkhorst RD. A Guide to the Author's TI-58-59 IOL Power Module. Intraocular Lens Power Calculation Manual. 2nd ed. New York;. 1981. Binkhorst RD. The accuracy of ultrasonic measurement of the axial length of the eye. Ophthalmic Surg. 1981 May. 12(5):363-5. [Medline]. Burton TC, Herron BE, Ossoinig KC. Axial length changes after retinal detachment surgery. Am J Ophthalmol. 1977 Jan. 83(1):59-62. [Medline]. Byrne SF. Improving A-Scans. Ocul Surg News. 1994. 12(6):86-7. Clemens S, Kroll P, Rochels R. Ultrasonic findings after treatment of retinal detachment by intravitreal silicone instillation. Am J Ophthalmol. 1984 Sep 15. 98(3):369-73. [Medline]. Hoffer KJ. Axial dimension of the human cataractous lens [published erratum appears in Arch Ophthalmol 1993 Dec;111(12):1626]. Arch Ophthalmol. 1993 Jul. 111(7):914-8. [Medline]. Hoffer KJ. Biometry of 7,500 cataractous eyes. Am J Ophthalmol. 1980 Sep. 90(3):360-8. [Medline]. Hoffer KJ. Take velocity of ultrasound into consideration in IOL calculations. Ophthalmology Times. 1993. 18(17):40. Hoffer KJ. The Hoffer Q formula: a comparison of theoretic and regression formulas. J Cataract Refract Surg. 1993 Nov. 19(6):700-12. [Medline]. Hoffer KJ. Ultrasound velocities for axial eye length measurement. J Cataract Refract Surg. 1994 Sep. 20(5):554-62. [Medline]. Holladay JT. Cataract surgery in patients with previous keratorefractive surgery (RK and LASIK). Ophthalmic Practice. 1997. 15:238-44. Holladay JT. How do you calculate the intraocular lens power after radial keratotomy?. Ophthalmol. 1996. 28:66-9. Holladay JT. Intraocular lens power calculations for the refractive surgeon. Operative Techniques in Cataract and Refractive Surg. 1998. 1:105-17. Holladay JT, Prager TC. Accurate ultrasonic biometry in pseudophakia. Am J Ophthalmol. 1993 Apr 15. 115(4):536-7. [Medline]. Holladay JT, Prager TC. Accurate ultrasonic biometry in pseudophakia. Am J Ophthalmol. 1989 Feb 15. 107(2):189-90. [Medline]. Holladay JT, Prager TC, Chandler TY, et al. A three-part system for refining intraocular lens power calculations. J Cataract Refract Surg. 1988 Jan. 14(1):17-24. [Medline]. Jansson F, Kock E. Determination of the velocity of ultrasound in the human lens and vitreous. Acta Ophthalmol (Copenh). 1962. 40:420-33. [Medline]. Jansson F, Sundmark E. Determination of the velocity of ultrasound in ocular tissues at different temperatures. Acta Ophthalmol (Copenh). 1961. 39:899-910. [Medline]. Kendall, CJ. Ophthalmic Echography. Thorofare, NJ:. Slack Incorporated. 1990. Meldrum ML, Davis JL, Patel A. Clinical application of the theoretically derived IOL power selection method in silicone oil-filled eyes. Symposium on Cataract, IOL, and Refractive Surg. 1995. Abstract 164:41. Olsen T, Nielsen PJ. Immersion versus contact technique in the measurement of axial length by ultrasound. Acta Ophthalmol (Copenh). 1989 Feb. 67(1):101-2. [Medline]. Olsen T, Thim K, Corydon L. Accuracy of the newer generation intraocular lens power calculation formulas in long and short eyes. J Cataract Refract Surg. 1991 Mar. 17(2):187-93. [Medline]. Olsen T, Thim K, Corydon L. Theoretical versus SRK I and SRK II calculation of intraocular lens power. J Cataract Refract Surg. 1990 Mar. 16(2):217-25. [Medline]. Ossoinig KC. Standardized echography: basic principles, clinical applications, and results. Int Ophthalmol Clin. 1979 Winter. 19(4):127-210. [Medline]. Ossoinig KC. Standardized Ophthalmic Echography of the Eye, Orbit, and Periorbital Region. A Comprehensive Slide Set and Study Guide. 3rd ed. Goodfellow, Iowa City:1985:12. Packer M, Fine IH, Hoffman RS, et al. Immersion A-scan compared with partial coherence interferometry: outcomes analysis. J Cataract Refract Surg. 2002 Feb. 28(2):239-42. [Medline]. Patel AS. IOL power selection for eye with silicone oil used as vitreous replacement. Symposium on Cataract and Refractive Surg. 1995. Abstract 163:41. Retzlaff JA, Sanders DR, Kraff MC. Development of the SRK/T intraocular lens implant power calculation formula [published erratum appears in J Cataract Refract Surg 1990 Jul;16(4):528]. J Cataract Refract Surg. 1990 May. 16(3):333-40. [Medline]. Retzlaff JA, Sanders DR, Kraff MC. Lens Power Calculation - A Manual for Ophthalmologists and Biometrists. 3rd ed. Thorofare, NJ:. Slack Incorporated. 1990. Sanders DR, Retzlaff JA, Kraff MC, et al. Comparison of the SRK/T formula and other theoretical and regression formulas. J Cataract Refract Surg. 1990 May. 16(3):341-6. [Medline]. Schelenz J, Kammann J. Comparison of contact and immersion techniques for axial length measurement and implant power calculation. J Cataract Refract Surg. 1989 Jul. 15(4):425-8. [Medline]. Shammas HJ. A comparison of immersion and contact techniques for axial length measurement. J Am Intraocul Implant Soc. 1984 Fall. 10(4):444-7. [Medline]. Shugar JK, de Juan E Jr, McCuen BW 2nd, et al. Ultrasonic examination of the silicone-filled eye: theoretical and practical considerations. Graefes Arch Clin Exp Ophthalmol. 1986. 224(4):361-7. [Medline]. Yang S, Lang A, Makker H, Zaleski E. Effect of silicone sound speed and intraocular lens thickness on pseudophakic axial length corrections. J Cataract Refract Surg. 1995 Jul. 21(4):442-6. [Medline]. Disclosure: Received unrestricted educational grants for speaking at various regional, national and international conferences.. for: Alcon, Keeler, Johnson & Johnson Vision, Carl Zeiss Meditec, Haag-Streit, Quantel Medical and Sonomed. Disclosure: Serve(d) as a director, officer, partner, employee, advisor, consultant or trustee for: Alcon, True Vision, B&L, Castle Laboratory. Fast Five Quiz: Can You Properly Address Cataracts?